DIGITAL INNOVATION IMPROVES THE BOTTOM LINE FOR ANESTHESIOLOGISTS: Access to electronic health records (EHRs) and Anesthesia Information Management Systems (AIMS) is giving anesthesiologists an avenue to strengthen their bottom line, according to Healthcare IT News. Liability: Providers may be worried that false readings that are automatically recorded by these health systems could impact patient care. For example, if a doctor were to accidentally lean on an automated blood pressure reader during an appointment, it could be added to a patient’s EHR. If the error was not caught, the provider could face liability for any complications stemming from related treatment. Level of care: Providers need to stay vigilant during procedures and must communicate effectively with patients to ensure the best care possible. However, there is worry that if the healthcare experience becomes too digitised that doctors will be more focused on their digital devices then they are on patients during procedures. However, early adopters have found that implementing digital systems, like EHR and AIMS, has actually improved efficiency and increased the level of care being provided. Using these technologies has allowed providers to give care without being slowed down by note taking and rigorous reporting requirements – there are very specific and cumbersome reporting requirements that providers must meet in order to qualify for Medicare funds as result of the Medicare Access and Chip Reauthorization Act (MACRA) and Merit-Based Incentive Payments System (MIPS). Athenahealth, Mercury Medical, and Recordation have all introduced digital platforms and services specifically for anesthesiologists. ACCENTURE FINISHES AI PLATFORM PILOT FOR THE ELDERLY: Last week, Accenture completed the three-month pilot for its artificial intelligence (AI) platform which focuses on helping seniors aged 70 years and older manage their health and daily lives. The AI-powered Accenture Platform was developed by the Accenture Liquid Studio in London and deployed through Amazon’s Echo Show – a voice-assistant enabled smart speaker with an embedded screen. The platform learns the user’s routines and preferences so it can suggest activities – through voice and on-screen prompts – that support user’s physical and mental health. Family members and caregivers can check in on the patient through the device to see if they’re active, whether they’re taking their medication, and if they’d changed caregivers. In addition, the platform can also spot abnormal behaviours and alert family or friends. As the aged population grows, remote-care enabling systems like the Accenture Platform could help to solve the issue of care delivery. These systems can supplement in-home visits, which are both costly and place a strain on human resources for healthcare organisations. The strain on the care provider workforce is only going to worsen. By 2025, US citizens aged 65 years and older will grow by more than 15% while the working age population is set to stagnate, according to PHI. TELADOC DROPS LAWSUIT AGAINST TEXAS BOARD OF MEDICINE: The telehealth giant dropped its longstanding lawsuit against the Texas Board of Medicine, after new legislation that allows for first-time patient visits through telemedicine came into effect in Texas on November 26, according to HealthcareITNews. Teladoc first began the anti-trust proceedings in 2015 after the board adopted a policy that stopped physicians from prescribing medication over the phone to patients they hadn’t seen in person. Teladoc lobbied hard for the new law to pass in Texas, seeing substantial growth opportunities in the state’s population of more than 27 million. 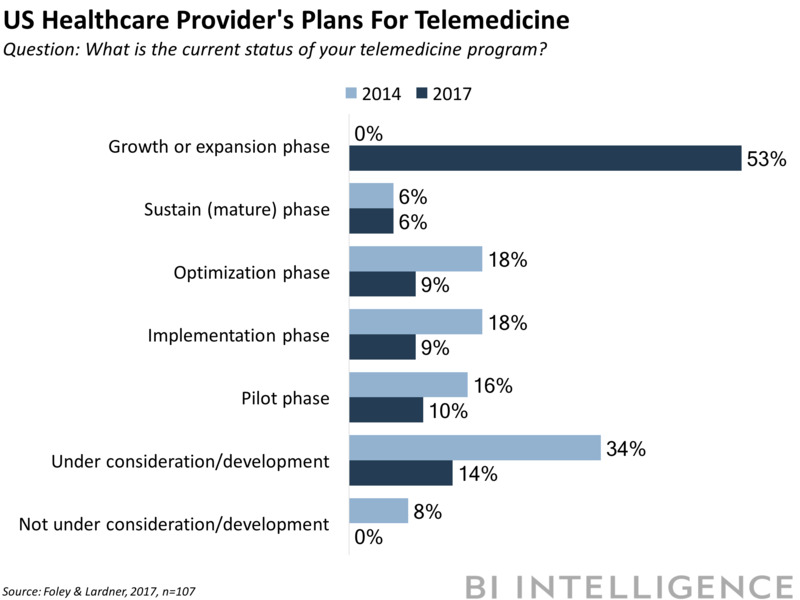 In other states, where similar laws have been enacted, telemedicine companies have vastly increased their reach by catering to the on-demand care market – people who haven’t established a primary care physician. Telemedicine is one of the fastest growing segments of mobile health – in early 2017, roughly 53% of US healthcare providers planned to expand their offerings and services, according to a Foley and Lardner survey. HEALTH ENGAGEMENT PLATFORM RAISES $US17 MILLION:Revel, the health engagement company, raised $US17 million in funding led by TT Capital, MobiHealthNews reports. The company engages with patients on the behalf of its clients, primarily payers, for things like annual physical reminders and form completion. These communications take place via email, text messages, and paper post. Revel plans to use the new round of funding to grow its platform and expand its functionality, including exploring artificial intelligence and new modes of communication. As the healthcare industry continues to shift its focus to value-based care and away from the fee-for-service model, platforms like Revel Connect can help to drive patient engagement, accelerate efficiency, and improve recovery outcomes. This could help recoup some of the associated costs for payers. Almost $US1 trillion in healthcare spending is wasted each year, largely because of inefficiencies that include unnecessary tests and redundant treatment, according to Harvard Business Review. Akous, a biotechnology startup that aims to restore and preserve hearing, raised $US7.5 million in funding led by 5AM Ventures and New Enterprise Associates, according to HIT Consultant. The company also secured licence agreements with Swiss biotech company Lonza and Massachusetts Eye and Ear for rights to the Anc-AAV gene therapy platform for hearing and balance disorders. Ieso Digital Health, a UK online mental health therapy provider, was named as one of the top ten disruptors in the Sunday Times, Cambridge Network reports.